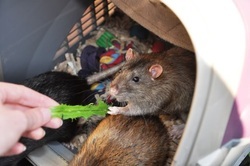 One of the single most important things to a rat, both in terms of enjoyment and health is their food. Few rats seem not to enjoy food and many rats overindulge to the point they become on the cuddly side. As with humans it is important for health and well being that they get a balanced diet as they are much like a child in the respect that they will eat whatever’s put in front of them, the fattier or sugarier the better. This is very much a left over from their wild ancestors, where easily available nutrients like sugary or processed foods, and fatty foods were scarce and incredibly valuable to rats forced to survive bad weather and foraging for their food. Our pet rats live much more comfortable lives, yet still carry this desire for tasty unhealthy foods and if given a choice they can and will eat far more than is good for them. As with us humans, and indeed any living creature, the right diet is important. Get it wrong and you can become deficient in the basic building blocks of life. You can leave yourself open to a range of illnesses and problems as well as limiting life expectancy. With a bit of thought you can really make the most of your rats diet, exploiting it to really suit your rats and help them live a long and healthy life, as well as an enjoyable one. Getting your rats diet right really shows in how they look, feel and act. Your rats will literally shine, with smooth glossy coats, lean well-muscled bodies and lovely thick round tails. As well as what you feed, how you feed it is also extremely important to our clever and inquisitive pets. For more information see Enrichment Feeding. Here is a list of Feeding related FAQ's I have come across. If you can think of anything else you would like to see in this section please let me know via the contact form.